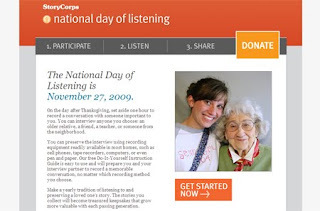 NPR joins StoryCorps in declaring Friday, November 27th the National Day of Listening. On this day, Americans are encouraged to record and share an interview with a loved one and to preserve that conversation for future generations. The National Day of Listening falls on the day after Thanksgiving, when friends and family are likely to be together and able to spend an hour honoring one another by listening. StoryCorps provides a Do-It-Yourself Instruction Guide and special toolkits to assist people in recording an interview and other National Day of Listening activities. Listen to other StoryCorps conversations to inspire you. Check out Listening is an Act of Love, a collection of true American life stories features pieces representing every walk of life from all fifty states, in a nation-wide and thematically arranged celebration of the nation's shared humanity.